Need an affordable, easy to use basic rice cooker? The Sanyo ECJ-N55W is a good candidate and will prepare around 16 cups of cooked white rice in a decent time frame. Using the cooker is easy, and all folks need to do is measure correctly, plug, select their desired setting…rice or soup/porridge, and press a lever. On average, it will take up to 20 minutes to prepare a bowl of rice (depending on altitude, amount added, etc.). The user also has the option to steam vegetables or a small bit of seafood such as shrimp, clams, or mussels using the included tray. A convenient benefit we liked about the Sanyo ECJ-N55W which helped it earn its “Good” rating. While we found through our research that cooking brown rice takes a little more trail and error to get somewhat right, overall, the rice quality is of good standard. However, this unit does work better with regular white rice. Included with this Sanyo 5 cup rice cooker comes a measuring cup, non-scratch rice spatula with holder, steaming tray, and manual. When the meal is finished, a keep warm mode will hold the rice (or soup if desired) at a ready to eat temperature until served. The unit can be carried to the table via the large cool-touch handle fastened to the cooker. Also, this Sanyo rice steamer cooker also comes in a larger 10 cup size…(see the ECJ-N100W). As we state on the page reviewing the larger model, the temperature sensor for the keep warm mode sometimes kicks in too late slightly burning or “crusting” the bottom layer of rice. Although this is not a major problem, nor a defect, this may or may not be an annoyance to some folks. In other words, it will sort of be the same as if cooking rice with a stove pot. Please keep in mind that this is a common occurrence with most single switch, rapid-boil style rice cookers. 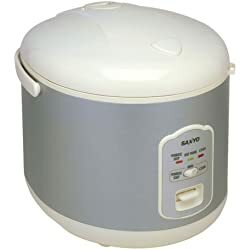 But for the price, the Sanyo ECJ-N55W is a good performer and another good choice when considering a reliable yet basic rice cooker to get the job done in good time with expected results.